The amount of 10 USD has been withdrawn from your account. Accounts: U4222871->U18919427. Memo: Shopping Cart Payment. 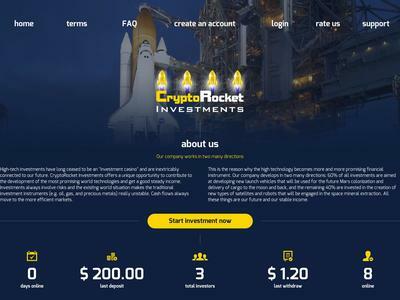 Deposit to CryptoRocket Investments User nelomota.. Date: 15:19 24.07.18. Batch: 222030638. The amount of 5 USD has been deposited to your account. Accounts: U18919427->U2631114. Memo: API Payment. Withdraw to Myinvestblog from CryptoRocket Investments.. Date: 20:22 24.07.18. Batch: 222061868. 24.07.18 21:38	Receive	Received Payment 0.3 USD from account U18919427 to account U13350807. Batch: 222068333. Memo: API Payment. Withdraw to bankhyip from CryptoRocket Investments. $0.30 has been successfully sent to your PerfectMoney account U10253714. 25.07.18 22:19	Receive	Received Payment 0.3 USD from account U18919427 to account U13350807. Batch: 222181123. Memo: API Payment. Withdraw to bankhyip from CryptoRocket Investments.